By Ronald A. Zumbrun, 3/11/2008 - Court warning to Planning officials -- immunity lost! The Ninth Circuit Court of Appeals found a silver lining within a gray cloud. The Court applied the findings of the Supreme Court's Lingle v. Chevron to eliminate government's long-held defense regarding private property takings. The court ruled that government officials can no longer rely on the "substantially advances a legitimate state interest" defense when regulating property. By Michael Shaw, 1/18/2008 - The recently decided Ninth Circuit case, Crown Point vs. Sun Valley, illustrates the contrast between social justice and equal justice. Social justice relies on the establishment of "civil law, " which is designed to expand government and its partners authority at the expense of individual liberty. Equal justice on the other hand respects individual rights and private property. The Crown Point case sets an example for equal justice. By Ronald A. Zumbrun, 9/13/07 - Since 1993, California planning department officials have relied on the State's "Landgate" decision for providing them confidence that they and their employers are immune from claims of abuse. This article describes the history, the relevant law and the legal attack on the Landgate precedent. Michael Shaw, President of Freedom Advocates is a plaintiff in both cases described in that attack. 5/16/2007 - On April 30, 2007, the Howard Jarvis Taxpayers Association presented a new initiative to the Attorney General’s Office entitled the “California Property Owners and Farmland Protection Act” to be voted on at the June 2008 election. It will reverse the eminent domain Kelo case for Californians by specifically defining “public use” as meaning use and ownership by a public agency for the public use stated at the time of the taking, such as roads, parks and public facilities. By Jim Beers, 5/2/2007 - The Clean Water Authority Restoration Act (CWARA) moves the Clean Water Act (CWA) beyond protecting wetlands and waterways, and creates legislation that would regulate nearly every wet area in the nation. This could include ditches, farm ponds and possibly groundwater. "Navigable" is the one little word deleted from the Clean Water Act. 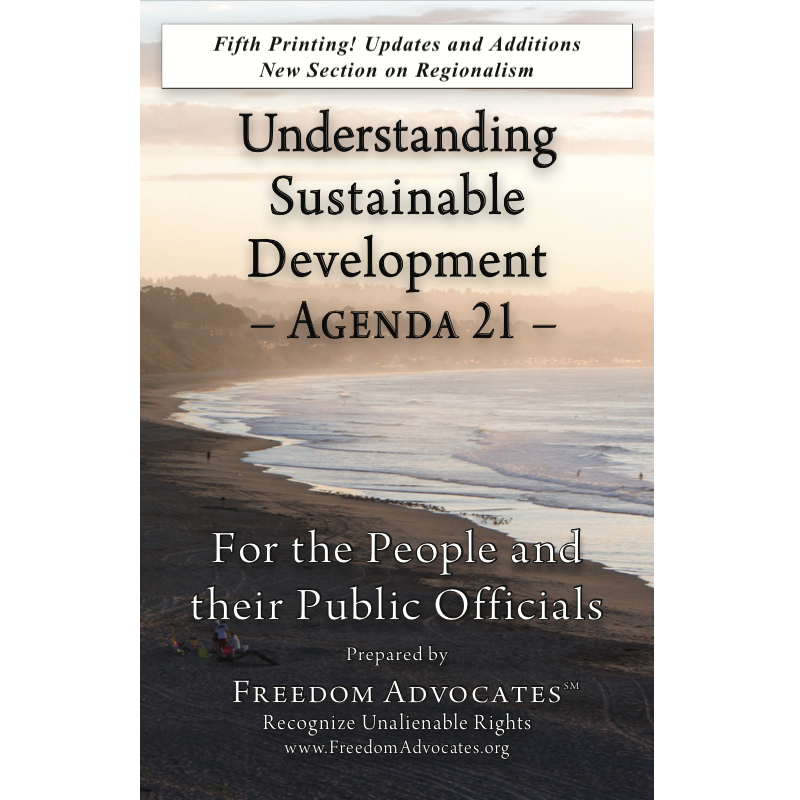 By William Roberts - Chapter Seven of Agenda 21 calls for the establishment of a “culture of safety.” All of Agenda 21, Chapter 7 is the expansion of UN Resolution 44/236 and the foundational material for the Federal Emergency Management Agency (FEMA's) "Multi-Jurisdictional All-Hazard Mitigation Planning" programme that fails to provide safety and destroys liberty.